Going abroad is not a distant dream anymore. In fact, come summers and the Indian streets seem deserted (if you do not consider dogs and beggars) as most of us are ‘holidaying’ abroad. Europe, South East Asia, Amrika – you name the place and you will find Indians sitting in Indian restaurants, sucking a chicken leg with a noise loud enough to shatter the lens of the Hubble. Indians going abroad is a welcome change when the roads back home seem a bit cleaner in their absence which in turn give some relief to the sweepers. It also gives me some sort of sadistic pleasure. The tourist destinations that boast of their superior infrastructure are tested to their limits. For how long can we curb the urge to throw that stained tissue on the road? For how long can we restrain ourselves from leaving a mark on the country in the form on a single straight stain on a wall that runs down to form a puddle? There are times when we would like to spit on the spotless roads, when we would like to honk the hired convertible to glory. No wonder Indians breathe a spit of relief the moment they land in their beloved motherland and throw the slurped paper plate of Dahi Bhalle on the road with tears in their eyes. They are doing a national service, they are helping the sweepers to retain their jobs and put food into the mouth of their army of kids. What I find a bit disturbing is the way nationals of other countries behave in the presence of an Indian dipped in his culture. Taking an example – We love to put Champakali, Chameli and Coconut oil in our hair. It is a recipe for our lush hair that has been passed through generations. Then why do we see people wrinkle their nose all around us when we go abroad? Don’t they get the exotic aroma rising from our head? Now we already smell of spices because of the kind of heaped-in-spices and swathed-in-oils food we eat since childhood. Add to that a dash of Champakali on our head and we turn into walking aphrodisiacs. Is the wrinkling because of the fact that we at times forget to use deodorants and smell like a dead rat? But how can that be when the oil and spices are so overpowering to make a person lose his consciousness in ecstasy? Beats me. We Indians are very colorful people. Ask a foreigner who has been to India and the first thing he will tell you is that he thinks the whole country has gone gay (which actually seems to be a very good idea considering our amoeba like growth). We love our colors so much that we carry them unabashedly to foreign lands. Even when foreigners all around us start wearing sunglasses indoors to save their eyes from the razor-sharp colors or when they hide their faces in the beer mugs because of the sight of the momma made jumper we are wearing, we fail to get the subtle hints. And why should we? What is the harm in adding some colors to their boring grey, blue and black life? To curb our habit of staring is another monumental task while we are abroad. If anything remotely Caucasian walks by, our jaw hangs dangerously. It is difficult to make a foreigner understand that we stare at anything. It is our way of admiring the beauty of nature. We also point fingers and giggle. It is harmless of course. Patience is the name of the seventh moon of Jupiter. That is why when we are subjected to the word while in queues in foreign lands, we respond with bewilderment. Why can’t they make a separate line for ladies, senior citizens, children, people in orange clothes, people in whites and people with two legs? How can everyone have so much time on their hand? Don’t they have a daily soap to catch, a maid to manage, a child to batter and a match to watch? Should we do as the Romans do or should we splash our superior culture all over the world and teach them a thing or two? Why not turn the question the other way around? What do we expect from a person visiting our country? Don’t we expect them to litter the roads, spit till they end up with salivary deficiency, eat and drink food sprinkled with fumes from the roadside stalls and bring out taser guns the moment they see four men walking towards them? So if we would like tourists to be a part of our culture and enjoy their stay here, then why can’t we reciprocate in a similar manner? In the same way that we are all proud of our culture where people leave soiled diapers in Taj Mahal, people from other countries will be proud of their shiny roads and non-aphrodisiacal surrounding and would like us to respect that. We know its their loss that they miss this chance to bask in our refined and better cultural glory during our stay in their country but we can leave them to their miseries. If we can adjust 7 people (dog included) on a motorbike, we can do this. Don’t you think? ahh..you forget to mention those ‘raj loves sweety’, ‘pinky loves b0bby’ etc etc beautifully decorated on the walls of monuments! I was talking more about what we do when we go abroad. 🙂 Back here, I don’t think there is anything we don’t do. Every possible act that negates the presence of a brain is performed back here. Yes, I have seen a few of the acts being performed by Indians travelling abroad. 🙂 The worse one is the oil dripping from hair. A person who is not used to the smell of coconut oil might choke to death. Kya baat karte ho. We are very well-mannered when abroad. We drive in lanes, don’t spit and pee on roads, no picking up fights either. No Sir, we are law-abiding model citizens. Apne true colors are reserved for the motherland! Oh yes, we are well mannered but there are certain things we keep doing that might be uncomfortable to other people. The ‘Oil story’ is the one I have witnessed most of the times. I’ve lived here for two years and 4 months now and I’ve definitely become a bit Indianized. I don’t litter on the streets or spit (gross), but I’ve become desensitized to poverty to a degree, that I thought would have been impossible when I first got here. As per my experience, once you have lived outside India, you really can’t go back to your old self after you come back. I was not able to do so. Honking still irritates me the way it did 3 years back when I landed in India after my 2 years stay in Manchester. You start seeing things in a different light. Just before reading this, I was fighting with a colleague who loves “littering” the roads in front of me just because I hate it when he does so ! People do that? I don’t have words! A few days back the driver of my bus wanted me to throw some tissues on the road. He realized his mistake when he got an icy glare and a piece of my mind. Very rich! I almost look at the rest of the world with pity. I think a lot of us have volume problems. We love to let people know what is going on in our personal lives and expect the favour to be returned. I believe serious outlash against Indians such as the one in Australia in not so distant a past is warning enough. There was a burglary where I stayed in Manchester. It happened before I moved there. The house faced the road and the curtains of the front windows were always open, displaying three software engineers working on their laptops and listening to music on their iPhones. Very tempting. The problem is that we do not try to blend in at all. 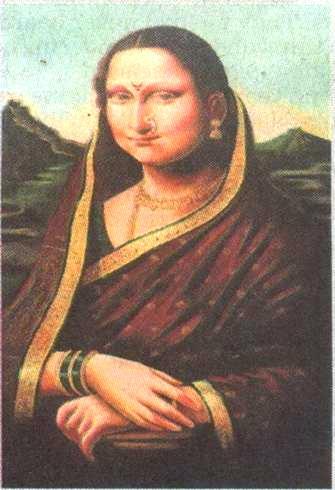 Good God that monalisa cracked me laughing..
How can everyone have so much time on their hand? Don’t they have a daily soap to catch, a maid to manage, a child to batter and a match to watch? And, yes. That is true. Well articulated post and can’t agree more to these. First time here, you have a nice space out here .. The elevator etiquette is what binds us together. Whether you are rich or poor, Engineer or sweeper, driver or politician, Brahmin or Shudra – this is something that is same across all divisions. I would say that it is a part of our culture. I almost fainted when I read your last line. 😀 Really, you are joking right? Anyways, thank you very much for reading and liking this blog. It means a lot when readers like you come ahead and appreciate what I write. And you saw Raaz 3? God! I had no idea I was encouraging people! I had some really bad time in UK with those hair oils. People will pour it on their head and come to office! There was this guy in my team who was slowly going bald. He got a medicine from somewhere and used to apply it and come to office. For days we thought he was not taking a bath. He smelled like a dead rat. It was embarrassing! I know we like our colorful clothes but they make us stand out in foreign countries. You will get undue attention at times. Gawking at people and asking very personal questions are my pet peeves. But I’ve met perfectly decent Indians who, if your eyes happen to meet, smile at you and move on. 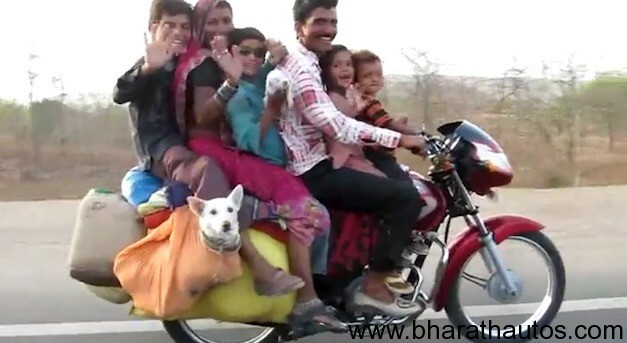 Loved the photo of the family on the bike – collapsed laughing when I saw the dog. Of course many would claim (with a touch of snootiness) that it is downright dangerous but who can deny this family have used the limited space on their two wheeler with ingenuity and their friendly smiles and waves gladden hearts? Oh yes! I did not notice the dog earlier either. My first thought on spotting him was that if the bike falls on him with the whole family, he has to be scrapped from the road. I don’t think the family even realize that they are breaking the law. The picture is very symbolic in that sense. It perfectly describes the way we live in this country. Kya baat hai sir ji. volume modulation ka button to indians mein hai hi nahi. Our culture is the only thing on your mind always. What surprises me is how people turn decent when they go abroad. How many Indians can you see littering the roads in Singapore? Of course not, they fear the law there. The same people will reach back home and start littering left right and centre. Talk about heights of hypocrisy! You were in UK right? Have you been to Southall in London? After so many Indians set up shop there, it has turned into a mini-India, complete with hawkers and peddlers and goodness knows what else. I believe the Brits fled the place soon after coz they couldn’t tolerate the mayhem. I have my sympathies for them 😛 just for this once! There was another one with six guys on a bike but I thought this family pic was much better. Look at the way they are waving, completely oblivious to the threat to their lives. People abroad turn decent only till they can’t get away. Go to New Jersey, Southhall or Canada, and you will find mini India sprawled there in all its glory. I came here from IHM’s blog and boy am i gladi did. Absolutely loved the last sentence in this post. Excellent. Clearly, the world has much to learn from us. I wish when we go abroad, we teach a thing or hundred to those damned foreigners in the style that our teachers and parents used on us – the small carrot and very large stick approach. If we don’t hit the point home (like, literally) how will they learn? I agree. The foreigners have no idea how to enjoy their life. What kind of people don’t spit on the roads, don’t litter and don’t honk. I can’t believe they lead such law abiding and boring lives. Amit, last year on a short trip to Malaysia I witnessed all this and more. Kids trampled my feet, women displayed no patience when it came to buffet lunches and men were fashionable late ( IST). It was embarrassing to say the least. I have seen this happen many times. On my trip to Paris, the trip operator told all of us very clearly that the buses will leave on time. If anyone is not able to make it, too bad. That person will then have to take the metro and reach the next destination on his own. A lot of people went straight as an arrow after that. ROFL! Reminds me of the British landlady who got curious about what we cooked for lunch, in Suffolk when I was about 6 or 8. Ma had made sambhar. Ma explained the recipe and showed her the sambhar powder. Mrs. Wembly or Wembly (I forget) bent down and took a deep whiff. She was down with cold and flu for a week, her nose and sinuses stood out shocking pink against her white face. Now we are like this only and we like our food like this only. Our sambhar is a WMD! Those words are so true. Loved the last line. Excooz me? We gave the world zero, Kamasutra, Yoga and Chicken Tikka Masala! Don’t you dare make fun of our superior culture. And my sources tell me, spitting will soon be made an Olympic event. Ab to hamara Gold-Silver aur Bronze pucca hai! And do you see how we are degrading in our Yogdans? From zero to chicken tikka – that says it all. I am thinking that we can create a record for the longest honk in the history of mankind. We are already so good at that. I don’t know about Rome shome but when in India litter, spit, be loud and clear, be colourful, be smelly, sweaty, eat like you have never eaten,….thts the natural talent we all are born with…..civic sense! Ah wats tht? Tell me. Never heard or seen. We carry the talents with us to foreign lands and display it at every slight chance. Following the laws there is a liability we have to live with. Seven people on a bike (to say nothing of the dog) is something we can do on our head. But the other stuff… *shakes head mournfully* naaahhh..! What baffles me is the fact that the very people who talk about the cleanliness in phoren countries are the ones who do not think twice before throwing the banana peel out of their car windows!!! Incredible India isn’t it? That image just made my jaw drop! The fact is that even when they are in foreign lands such people crave to break the law. It is only the fear of jail that stops their hands. My experience is that we strive to become whiter than the whites…apnaofying Halloween and Easter and cooking turkey at Thanksgiving, and of course, enrolling our children into ballet classes. No?! And the saddest is sometimes when you are polite, courteous and accommodating, it is taken to mean you are weak. Why would you not put your precious little wants/comforts/time/taste buds/sight buds/nose buds/ first unless you have no power or connections? Of course. Why would we want traits that make us better humans?